When he senses a business opportunity, Hitoshi Tanaka bets big and does everything he can do to make sure the initiative bears fruit. However, “determination to swing all the way is not something that everyone can easily have,” said Tanaka, award-winning founder and CEO of eyewear retailer Jins Inc., during a recent interview. “I think you learn it from a situation where you have no other choice but to do this. If you win or even if you lose, you’ll learn the importance of making such attempts,” he said. It is this approach that has seen Tanaka turn his company into a major Japanese firm in the market and one that has helped change the image of glasses. Jins was one of the first companies to come up with a business model of selling low-cost glasses in the early 2000s so people could more casually purchase eyewear, which would have normally cost tens of thousands of yen. The company also developed new functions for glasses, such as blocking light from digital displays, creating a market for people who don’t need to wear them to help their vision. Jins is now prepping for its next full swing, and the company thinks an opportunity is likely to emerge by introducing wearable devices, or eyewear integrated with digital technology. The potential of wearable glasses has been touted for years. But Tanaka said nobody, even himself, knows when the breakthrough will happen, adding that Jins will keep pursuing various possibilities. Given that Japan’s population is shrinking, the outlook for the domestic market is dim for many industries, but Tanaka is optimistic. “If the use of glasses is limited to vision correction, the market will shrink,” said Tanaka. However, if wearable devices can provide new services, it will be possible to cultivate new demand and motivate even those with good eyesight to wear the new types of glasses, he added. “Then, this market will enter a new stage, and we’ll probably be seeing new business models,” he said. 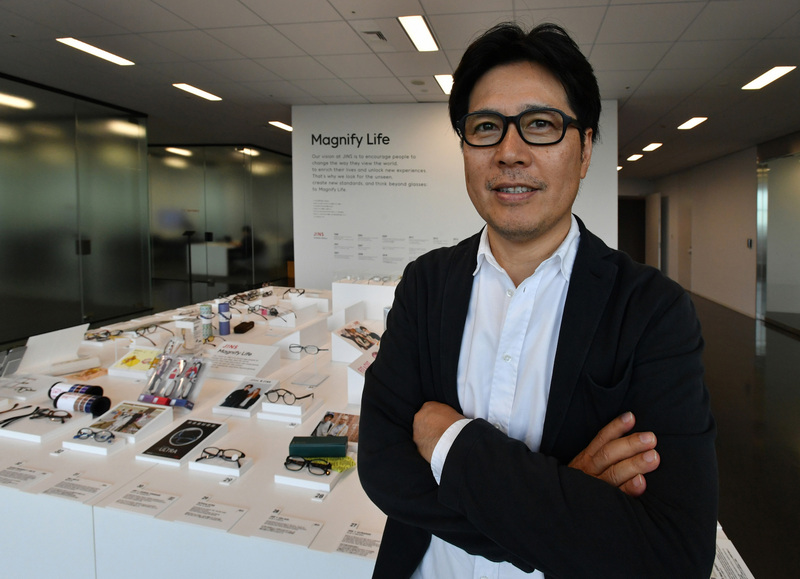 If glasses morph into a viable option as wearable devices, the business opportunity won’t end by just selling them, said Tanaka. Those devices could collect various data from wearers, such as the number of steps, blinks and eyeball motions. Eyewear-makers or third parties could then come up with new services, such as those connected to health care, by utilizing the data. “If successfully monetized, I think the concept of glasses will drastically change,” said Tanaka. It is even possible that glasses would be handed out for free to generate a greater number of users for these paid services. But no game-changer has emerged yet. Indeed, although glasses as wearable devices have long been considered a prominent candidate for the next big thing, they have not really succeeded so far, with Google Glass possibly the most notable example. Jins already sells an eyewear device called Jins Meme, which is equipped with sensors to detect eye and head movements and blinks. After connecting the device with the company’s apps, it tells users information such as their concentration level, posture and running form. But Tanaka said further development and improvement are still needed for the wearable. “I think nobody knows (when a breakthrough will happen), but it won’t occur unless people take a chance, and that’s what we are doing. We won’t give up and will keep trying,” said Tanaka, whose firm marks its 30th anniversary this year. 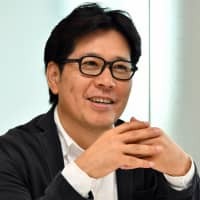 Jins has become one of the most well-known eyewear brands in the country, with 354 stores nationwide as of September, but probably few are aware that Tanaka did not start his business with glasses. After quitting a job as a banker in his hometown of Maebashi in Gunma Prefecture, Tanaka founded Jins in 1988. 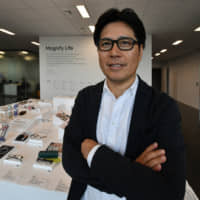 At first, his firm produced miscellaneous goods, including bags, but its direction changed after Tanaka traveled to South Korea in 2000, where he saw a pair of glasses being sold for about ¥3,000 that were ready to take home in 15 minutes. Tanaka had never bought glasses himself, so initially he didn’t realize the significance of this, but he later found out that a pair of glasses would normally cost much more in Japan, and people had to wait days to get them. Consequently, he saw a business opportunity and thought the price could be drastically lowered if his company oversaw production planning, manufacturing and sales by itself. Tanaka quickly acted and launched the first Jins store in Fukuoka in April 2001 with glasses priced at ¥5,000 or ¥8,000. Tanaka’s idea proved correct, with the store seeing an influx of customers. Jins also encountered an increasing number of competitors, but the firm survived and now earns more than ¥50 billion in sales annually, the third-largest figure in the industry. It has also opened stores in China and the United States. Looking back on its development, Tanaka’s full swings are evident. One of the defining moments, he recalls, was when Jins launched a new ultralight product called Airframe in 2009. When he saw the polyamide resin frame, he sensed it would be successful. The material was also suited for medical products, a fact that would increase trust in it, Tanaka thought. He told his workers to prepare 70,000 pairs, a staggering amount given that selling 2,000 pairs a month would be considered a hit product at that time. But not many others seemed as excited as Tanaka. “When I showed the frame to other people, many said it felt like a toy,” he said. Yet Tanaka decided to run TV commercials for the product and prepared a ¥500 million budget for just one month of adverts. Back then, Jins usually spent just ¥100 million for a yearlong run of adverts. Tanaka took a full swing but did not miss. Jins sold the 70,000 pairs in less than a month, making Airframe Jins’ major brand, with its sales topping 17 million pairs. Tanaka also swung hard when Jins launched glasses in 2011 for cutting the so-called blue light emitted from digital devices such as smartphones, which is believed to produce eye fatigue and affect the body clock. Assuming that many would want such glasses amid the spread of smartphones, Tanaka ordered 100,000 lenses. The firm sold 1 million pairs in a little over a year, and the glasses have also become one of Jins’ signature products. Such full swings show how Tanaka had continued to walked the path of an entrepreneur. In fact, before the Airframe launch, Jins had been struggling, as other eyewear retailers became more competitive. With the firm posting losses and the stock price falling below ¥50, Tanaka even received takeover offers to turn around the company. At that time, he met Fast Retailing Co. chief Tadashi Yanai, who advised him that a company must have a solid vision. Through this, Tanaka said, Jins has been focused on providing new value through eyewear. “We would have taken a different path if we’d just wanted to sell a massive amount of low-cost glasses,” he said. 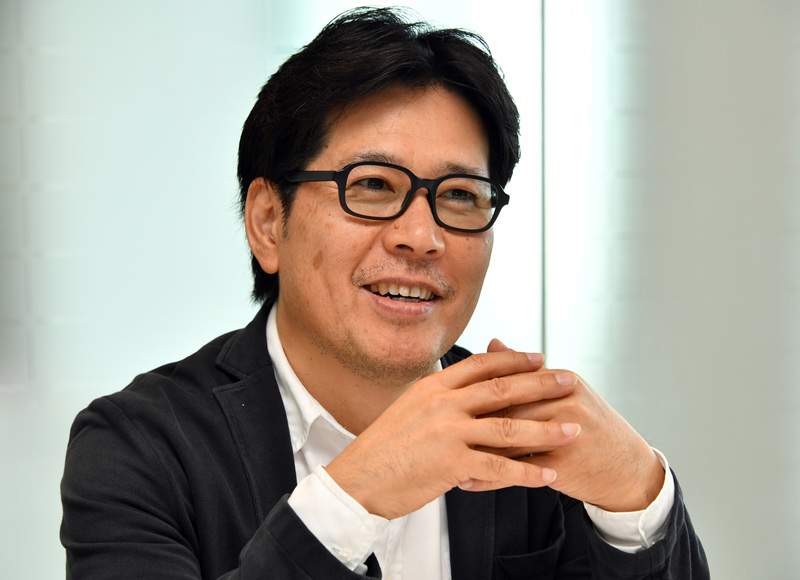 Still, maintaining competitiveness and growth is a tough task, especially when a company becomes very large, said Tanaka, whose firm now employs more than 3,700 people. “We have to keep challenging (ourselves). This applies not only me but also each employee here, otherwise we won’t grow. But people start coming to work as a routine when the company grows big. That’s when the company loses its competitiveness,” he said. Tanaka also launched a private foundation in 2014 to encourage young people in Gunma to launch startups. Asked what advice he would give to young entrepreneurs, he said one thing is that they should find what they want to do and pursue it.